Discover Everything You Need To Know About Your Adorable Pet Bunny Rabbit! special rabbit companion a longer, healthier, and happier life! Click here to get your free guide!" Our Complete Rabbit Care Guide explains in a clear, step-by-step manner everything you need to know to give your pet rabbit the loving care he or she needs. In 7 days or less, you can become a rabbit expert! How to pick the right rabbit for you! How to "rabbit proof" your home! How to understand your rabbit! How to litter box train your rabbit! How to raise rabbits with children! How to make rabbit care hassle-free! How to train a rabbit to stop bad habits! How to get your rabbit to love and trust you! And much, much, more! Are you are considering buying or adopting a rabbit as a pet? Or do you already have a pet rabbit? Wouldn't you like to be sure that you are providing your special rabbit companion with the emotional and physical care he needs for a long, healthy, and happy life? Now you can quickly and easily learn everything you need to know to provide your rabbit with the care he needs for a longer, healthier, and happier life ... all from one easy-to-read resource. I recently purchased your rabbit guide, and just wanted to let you know how pleased I am with it! I just adopted my first rabbit, a female mini rex 9 week old named Sophie. Your guides are my saving graces!!! Thank you so much for such a well informed and put together resource! With this comprehensive, up-to-date resource guide, you will acquire the knowledge and skills that will make you a Rabbit Expert! Is a rabbit the right pet for me? The pet store has many rabbits...How do I know which rabbit to buy? There are so many different breeds. What are the pros and cons of each? How do I get my rabbit to love and trust me? How can I tell if my rabbit is a boy or girl? How do I "rabbit proof" my home? How will rabbits interact with my children? With my other pets? Do I need to exercise my rabbit? If so, how? What do I feed my rabbit? Hay? Pellets? Veggies? How do I litter box train my rabbit? Should I keep my rabbit indoors or outdoors? Which is better? How do I groom my rabbit? Am I supposed to give him a bath? Do I need to trim his nails? If so, how? Do rabbits need vaccinations? If so, which vaccinations? How do I clean my rabbits ears? How often should I do that? Is it ok to pick my rabbit up? If so, what is the proper technique? Why does my rabbit sometimes act aggressive? Should I get my rabbit neutered/spayed? How do I find a good rabbit vet? furniture, or digging in the carpet? In the Complete Rabbit Care Guide, you will discover the answers to all of these questions...plus much more! Turn Your Family's Pet Rabbit Dreams Into Reality! If you are thinking of buying or adopting a pet rabbit for you and your family, you are in very good company ... there are nearly 15 million pet rabbits kept in the United States today. While rabbits may not be quite as popular as cats and dogs, they are terrific as pets and often much easier to take care of! But you might be wondering exactly what to feed your new buddy or how to litter-box train him or her. Most of us know to walk dogs and to give cats scratching posts, but what sort of exercise should you enable your rabbit to do? Important things to consider when buying a rabbit. The different breeds of rabbits, and the pros and cons of each breed. How to determine if you have enough space for a rabbit. The best places to find friendly, healthy rabbits. How to prepare for your pet rabbit. Little known secrets about how to keep your rabbit healthy. What to feed your rabbit to help ensure that he remains healthy. What NOT to feed your rabbit (foods that can be poisonous to your rabbit). The hassle-free way to clean up after your rabbit. How to raise your rabbit with other animals. check his teeth, clean his ears, clean his eyes, and clean his scent glands. way to pick them up, and how they like to interact with other animals. How to teach your children the responsibility of raising rabbits. Whether you should raise your rabbit indoors...or out. How to build a cage...indoor or outdoor. How to tell if your rabbit is a boy or girl. How to pick the right vet for your rabbit. such as chewing, digging, biting or aggressiveness. How to play with your rabbit, including what toys he will like best. How to breed and show rabbits. You get the Complete Rabbit Resource Guide FREE! This guide is a comprehensive directory of rabbit resources. This handy reference guide has great information such as descriptions and website links for rabbit-related websites, discussion forums, and chat rooms. This resource guide will also show you the best sources for rabbit supplies, cages, medical supplies, feed, hay, toys, and more. You get the Complete Rabbit Breed Guide FREE! This Complete Rabbit Breed Guide has been labeled by some of our customers as the Rabbit Breed Encyclopedia. This guide lists the various rabbit breeds along with color photos and specifications for each breed. It also lists the name, address, and website link for the national club for that particular breed. You get the Poisonous Plants Guide FREE! This Poisonous Plants Guide is a lifesaver...literally! You will be surprised to find out which plants can be poisonous to your rabbit! This guide lists all of the plants, as well as the specific parts of the plants, that can be poisonous to your rabbit. This guide is a definite "must-read" for every rabbit owner! You get the Rabbit Treats And Toys Guide FREE! We all want to spoil our rabbits, giving them tasty things to eat and toys to play with. But store-bought toys and treats can be expensive...and boring. This guide will show you how to make tasty rabbit treats from scratch, as well as toys you can find around your house or make cheaply from easy-to-obtain material. You get the Rabbit Name Book FREE! Some people don't name their bunnies...some people are happy just naming their rabbit "Bunny". But for the rest of us, a more creative name is absolutely a must! The Rabbit Name Book lists tons of creative and fun rabbit names. Names like Buster, Daisy, Dakota, Butterscotch, Shimmera, Uncle Buck, and hundreds more. You get Detailed Plans for Backyard Rabbit Hutch FREE! This guide will show you how to build a backyard hutch for your rabbit (if you choose to house your rabbit outside). This guide has detailed illustrations and directions that will make it very easy to construct your very own backyard rabbit hutch. You get our Bunnies & More newsletter FREE! You will receive our newsletter "Bunnies & More." Each issue will deliver tons of rabbit care tips and secrets, as well as reviews on the latest products. We will also show you how to get special deals and discounts on your rabbit goodies. This information alone is why many of our readers subscribe to our newsletter. You will receive all 7 of these EXTRAS with YOUR Complete Rabbit Care Guide Package! Wouldn't You Like To Become A Rabbit Expert? For a limited time only, you can take advantage of a special promotional offer and receive the Complete Rabbit Care Guide Package for FREE! Get Your FREE Complete Rabbit Care Guide Package NOW! Fill in the form below and click on the button to get your free guide. anyone! I respect your privacy and hate junk email just as much as you do! So you get the Complete Rabbit Care Guide and the 7 valuable extras....for free! So what are you waiting for? Fill the above from in and get your Free Rabbit Care Guide Package! P.S. 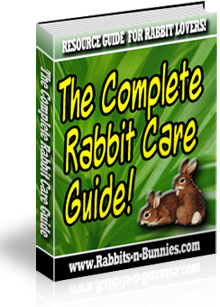 The Complete Rabbit Care Guide Package will provide you with the knowledge and skills you need to provide a rabbit with outstanding emotional and physical care and a stimulating environment. Gain the knowledge and skills that you need to ensure your rabbit is the perfect pet! Get YOUR Complete Rabbit Care Guide Package today! P.P.S.Where else can you get all the latest information on rabbits and rabbit care in one easy-to-use resource? Why spend hours and hours tracking down information that may or may not be reliable when you can learn everything you need to know about buying and caring for a rabbit - and I do mean everything - in one convenient, inexpensive guide?